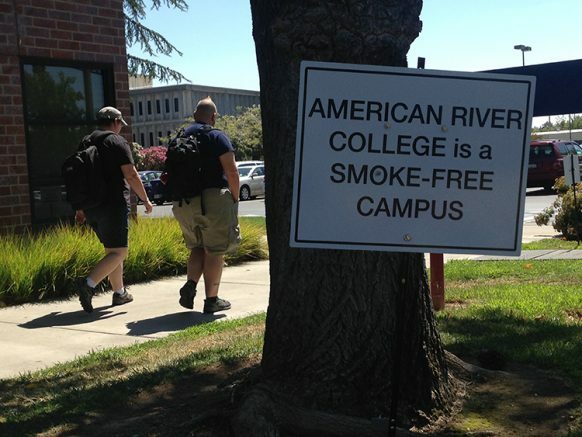 Smokers at American River College have been relegated to the edges of campus without smoking sections or ashtrays since the smoking ban went into effect Jan. 1. The amount of cigarette butts scattered around the bus stop on College Oak Drive in front of the administration building is piling up without designated smoking areas. Los Rios campuses implement their own rules on the system-wide ban on smoking and although Sacramento City College and Folsom Lake College have designated areas, ARC is completely smoke and vapor free. Ryal Strom, an ARC student, risks being late to some classes because of having to smoke at the edge of campus. According to a campus survey taken before the smoking ban, 76 percent of students and 83 percent of faculty supported a smoke-free campus. However, there have been no steps to help smokers not litter. Leah Cato, ARC student and smoker, feels that without a smoking sections on campus, some smokers could suffer from stress. Shelby Takens, non-smoker, thinks that a smoking section would be fair for smokers. According to the California Department of Public Health, 15.5 percent of men between the ages of 18-24 smoke and 10.5 percent of women aged 18-24 smoke in 2012. In 2013, 8.6 of adults aged 18-24 use e-cigarettes. With a population of nearly 30,000 students, statistics suggest there are over 3,000 who smoke. This could lead to an even larger litter problem on the edges of campus. Victor Garcia, an ARC student and non-smoker, said that although he has asthma he would be fine with smoking sections at the edge of campus. Najibullah Sahak, non-smoking ARC student, agrees with Garcia. Sustainability at ARC receives $50,000 for recycle bin installations. 1 Comment on "Smokers “pushed to the edge” by campus-wide smoking ban"
Quit your whining. Nobody owes you a place to smoke. When I was in the military, all the tobacco users used dip tobacco so there was no litter. You think your classes are stressful? Try working on flightline for 12+ hours with no time for smoke breaks and barely time for lunch. Grow up and lose your sense of entitlement.